As the biggest network in forest science, IUFRO unites about 700 member organizations in more than 110 countries, representing over 15,000 scientists. Just as students within IFSA, all scientists contribute and collaborate voluntarily within IUFRO. 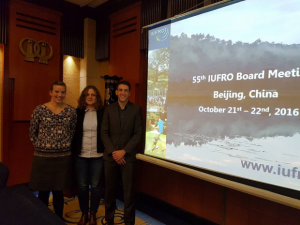 Numerous research meetings, small and large, are organized by IUFRO members every year. The biggest in 2017 will be the 125th Anniversary Congress in Freiburg, Germany taking place 18th-22nd of September, were IFSA will also be actively involved. Part of the MoU and one of the supporting initiatives for IFSA is the “Joint IFSA/IUFRO Position”. It is financed by IUFRO and offers a young forestry professional the opportunity to work at the IUFRO Headquarters in Vienna, Austria. Their working time is equally divided between IFSA and IUFRO and they also help in creating a stronger collaboration between the two organizations. Currently this position is held by Janice Burns from Canada. One of her main tasks is to support the “Joint IUFRO-IFSA Task Force on Forest Education“, an ambitious joint project of the two organizations (more details about the JTF can also be found in an interview with Lena Lackner, one of the coordinators, in the January issue of the Tree news). The one year position comes with the possibility to be extended for a second year, to allow for continuity. As Janice has been doing a terrific job and is still very motivated to work with the two organizations, IUFRO and IFSA were happy to extend her contract. She will continue in the position until January 2018. An open call to find new candidates for the Joint IFSA/IUFRO Position will start in July this year. Another goal of the collaboration is to create opportunities and encourage IFSA students to participate in scientific meetings. For example, the participation fee for the IUFRO World congress is waived for a number of students. IFSA will organize a number of events at this year’s “125th Anniversary Congress”. For this purpose an IFSA commission headed by Dylan Goff has been created. A sub-plenary session with the title “Our Future Forests” will take place on Wednesday the 20th of September. It will focus on four topics (Forest and climate change, Forest Education, Definition of “Forests” and/or “Forestry” and Innovative Technologies) and include video statements from several IFSA members. A workshop in the style of an Incubator session will be held alongside the congress giving students the opportunity to present their projects to a broader audience. Further training and sub-plenary sessions, targeting students and young professional, are organized by the “Joint IUFRO-IFSA Task Force on Forest Education”. The editor-in-chief of “Tree News – IFSA’s Online Editorial”, Meike Siegner, will hold a workshop on online journalism. Additionally, IFSA and IUFRO are jointly organizing a mentoring program, which brings together students/early career researchers and senior scientists during the congress. Every year a paid internship is granted to an IFSA student by IUFRO. The open call for this year’s internship has just closed. The successful candidate will be notified in early May. He or she will start their two month stay at the IUFRO headquarters in mid-October. There are many ways to get involved and benefit from IFSA’s partnership with IUFRO. If you have any questions or ideas please don’t hesitate get to in touch. The author, Lisa Prior is a master student at Göttingen University in Germany and the current Liaison officer for IUFRO [lisa.prior.ifsa(a)gmail.com].